Milk Quality is a top priority for dairy farmers and with that brings the need for farmers to regularly re-evaluate their dairy hygiene routine to ensure the highest possible standards. Dairygold’s team of Milk Advisors work with their milk suppliers to ensure the best industry practices and highest quality and hygiene standards are maintained. The new Gold Assure range of Dairy Hygiene products was formerly branded Dairygold and has been trusted by Dairy Farmers across Munster for decades. Gold Assure is a cost effective range of gold standard, Teagasc approved, bulk tank and dairy equipment detergents, descalers and sanitisers as well as ready to use teat disinfectants. With an increasing number of dairy farmers moving away from detergents containing chlorine when washing their bulk tank or milking machine, Gold Assure Universan CF, a chlorine-free liquid detergent has been added to the range for 2018 which contains Alkali Hydroxide of 26-28%. Commenting on the launch of Gold Assure, Tipperary Dairy Farmer, John Walsh who scooped the top prize in the 2017 Dairygold Milk Quality Awards said “I’ve been using Dairygold’s Dairy Hygiene products for a number of years now, achieving excellent TBC and thermoduric results. 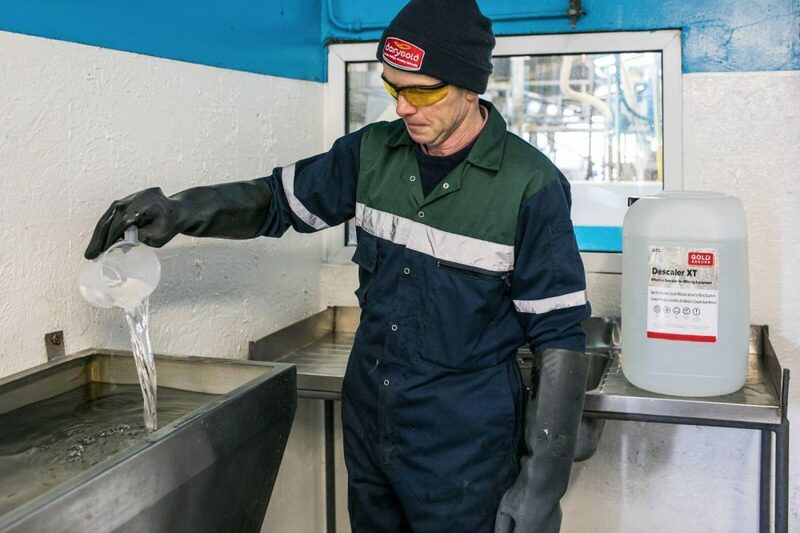 We recently introduced the new chlorine-free bulk tank detergent, Gold Assure Universan CF to our dairy cleaning routine in an attempt to eliminate and reduce TCM and chlorate residues. We look forward to using the Gold Assure range this Spring and plan to maintain our award winning standards as a result”. Gold Assure Dairy Hygiene Range is now available from Dairygold Co-Op Superstores across Munster and online for delivery direct to your farm at www.coopsuperstores.ie. Shop our Gold Assure range here and avail of convenient home delivery.